There are three to four pitches depending on how you split the route up. Generally done as a short pitch, long pitch and short pitch. P1: 20m 5.7, 3 bolts. Start left of the toe of the arete, at a ledge above the high-water mark. Climb up and right to the crest of the arete and a belay ledge. P2: 40m, 5.6, 8 bolts. Climb on and just left of the crest of the low-angle arete, past an intermediate station used mostly for single rope rappels with short ropes, to gain a big ledge with a number of chain stations. P3: 25m, 5.8+/9-, 3 bolts. cross the ledge and climb a slab dihedral just right of a blank corner. The crux is immediately obvious past a short overlap and is done with a bolt at the waist; the rest of the pitch is 5.7. At the top, hook back left to the belay ledge and bolts in the trees. A 5.10c variation to this last pitch climbs to the left, around the corner, to the same upper belay location. A number of “near misses” have occurred on Star Chek in the past few years. These are the result of climbers trundling rocks off the top of the climb onto people leading below. 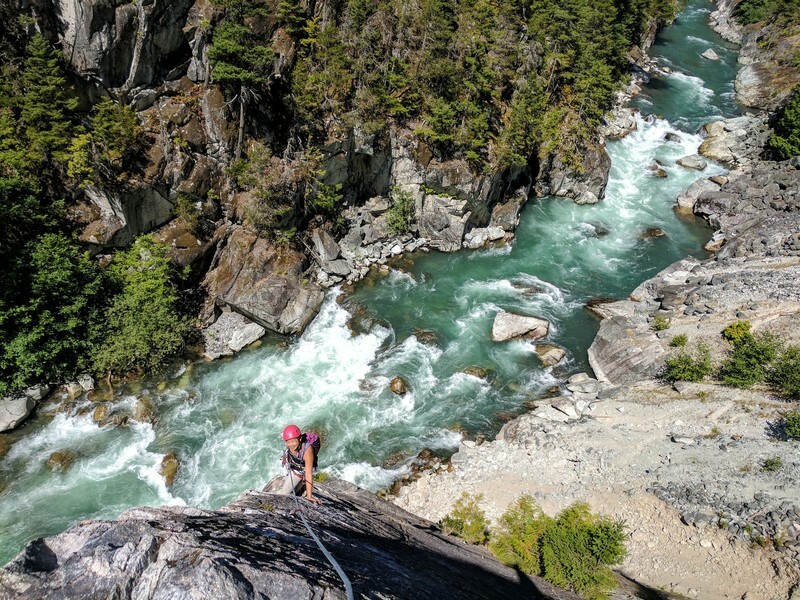 For this reason, the top-down approach described in Squamish Select is no longer recommended. Instead, approaching from below is advised. To do so, continue driving north along Highway 99 until it’s possible to park in the large, paved pullout/picnic area near the bottom of the hill on the west side of the road. From here, hike south back along the highway until above a large talus slope. Descend it with caution before curving south through a gap in the forest. Pop out at a series of small crags where the buttress of Star Chek becomes visible directly ahead. Carefully work across the scree and then down toward the base of the climb near the river. Fixed ropes provide protection to the base of the crag and should be visible before you start crossing the scree. There is a relatively solid trail higher up on the scree near the base of the crag leading down to the fixed ropes; if the terrain becomes too loose for comfort you're probably going down the hard way! Regardless of how you approach, be very mindful of the loose rock. 8 quickdraws plus a couple extra ones to leave behind at stations on the rap in and collect on the way back out. Lauren following the beautiful 2nd pitch. CN Railroad trestle downstream from Star Chek. Both the first and the third pitch have four bolts, not three. When rapping the route, use the anchors to climbers left for the second rap, not the ones on the right near the arete which are used for the actual climb. If you have a 70m, you can avoid the last rap as well if you are careful about rope ends. From the second to last rap station, angle slightly left towards the trees and away from the arete. A 70m will just barely get you to the fixed rope along the bottom of the climb. We rapped the route, but were told there is another rap route just past the top anchors of the route that reaches the ground in two raps with a single 60m rope. This would be far preferable with other parties on the route, because rapping past them while climbing is sucky. You will see the rap anchors in question if you walk past the top anchors for star chek across the gravelly slab (be careful) and peer over the edge (climber's left from star chek). just past the edge there are two bolts with quick links, which is consistent with the mid pitch two rap anchor on star chek. I did not use these rap anchors, I only heard from other climbers that they lead to the ground in two 30m or shorter raps. Can anyone confirm? Fun climb! There are bolted stations to climber's left that are rigged for 30 m rappels (i.e., with a 60 m rope). The first station is on the starting ledge at the top, though there is also one just below the lip for some reason. We got our rope stuck in a crack in the roof on the first rappel, so be careful. Three raps will get you to the bottom easily, though there are more stations than that. Just climbed this on a Friday and didn't see another person until we we're headed back to the car. This climb had everything I like in an adventure. Don't be scared off by all the hype about the crowds of people. Some popular climbs can still be a remote and serene experience if you time it right! WEAR your HELMET and watch out for seriously rockfall from people carelessly rapping the route. The top pitch and the base are both shooting alleys for a lot of loose rock and this is easily observed by the multiple smashed bolts on this wall. Only a matter of time before one gumby kills another gumby on this route. We found the guidebook's description of the approach pretty confusing. What we ended up doing was pulling into the gravel parking lot (you'll see Squamish signboards too) and then hiking South past the "bridge" (looks less like a bridge and more like the side of the highway has a railing) until we reached the rocky mound where we easily found the cairn and made the scramble down the fixed lines to the top of the route. Go to the right to find the rap rings, not the left, since the rap rings on the left are the final anchors for Star Chek. When we went to the right, we found two places we could rap from, -- there were rap rings near a tree as well as rings if you peered over the edge. We decided to use those, since we were worried that pulling the rope after rapping from the rings near the tree would just pull down more loose rock. I found rapping from the edge a bit scary since you're just sitting on the edge and leaning over to secure your PAS before scrambling/falling onto the ledge. From there though, we made it to the ground in 2 easy rappels with my 70m. My lovely friend Allison following on the second pitch of Star Chek! Superfun! Very short first pitch (didnt feel any harder than the second one), the second one its pretty amazing easy climbing and long enough to get into it, the third one has a well protected and fun crux. DO NOT RAP THE ROUTE, or even use the rap line next to it. With the vastly improved trail condition there is absolutely no reason to rappel down the cliff. Rapping adds significant time and hazard (rockfall, double highway walking, more hand lines, rappelling, etc.) to both your party and the others on the wall. The ledge above the route is covered in lots of VERY loose rock that would be all too easy to knock down onto people below you, so please avoid rappeling and also be very careful when you are walking off the route or milling about at the top. The approach trail took maybe 15-20 min at most which is much, much less than doing multiple rappels plus walking down the highway shoulder and navigating several fixed hand lines. To gauge how popular this route/area is, we were a group of 3 and we arrived at 7:40am on a sunny Wednesday morning and there were already 2 cars parked there, probably one group. We never saw the group ahead of us since we hiked down and didn't rap, but we started up pitch 1 by about 8:15am and there was a group of 2 rapping down the separate rap line by then. By the time we hit the top around 9:45am there were at least 4 groups of 2 that had rapped down and we passed another 2 groups of 2 who were heading to the top of the rap route on our hike back to the cars, one of which we turned around and sent down the trail (they probably would pass the last group rapping). One group might have been doing Beam me up, Scotty but otherwise there were at least 5 groups of 2 in line for Star Chek by 10am on a weekday, and all of them planned to rap down. If you hike down on a busy day you'll prob skip a few groups up in line. Probably more popular in the morning on hot days as the route is in the shade for several hours after sunrise. Park at the Cheakamus Canyon Picnic Site (GPS coords given by previous comment) and hike the obvious trail south along the ridge in the trees (not on the shoulder of the road, that's for the return hike). Do not stray off the trail down the steep drainage ditch early on, the first stretch of trail is mostly flat and stays high on the ridge before going gradually down the hillside through a boulder field and out onto the slopes above the river. When you hit the river there are a few cairns to guide you up and over a hill and then it's a pretty straightforward scramble over and down to the start of the route at the water's edge. The trail is not sketchy at all with the slight exception of the last 30 ft or so of traversing along a loose dirt/rock hill but just go slow and it's fine. I found the hand line at the end of the rap line much sketchier as it's like 20+ feet above the skree field for some reason, so if you did slip off without being clipped in you'd take a nasty fall and probably bounce into the river. Hiking in I found no reason to use the hand line for the approach. You can climb up a few feet and clip into a loop of the hand line to set up a hanging belay for the first pitch to keep your rope out of the dirt as there is neither a good stance nor rope spot at the bottom of pitch 1. - If you are a group of 2 it's easy to link pitches. Doing it in 3 pitches will be more balanced for the two climbers, however, assuming you swing leads, as the middle pitch is really long. - If you have a 60m rope, there is a 2nd set of anchors on a great ledge about 3/4 of the way up pitch 2 that you could climb to from the bottom of pitch 1 (20m pitch 1 plus appx 30m partial pitch 2 to this first belay spot = 50m). From there you can easily climb to the top of pitch 3 (appx 10m partial pitch 2 plus 25m pitch 3 = 35m), just add a long runner when you clip into the pitch 3 belay station to reduce rope drag. - If you have a 70m rope, you could climb from the bottom of pitch 1 to the belay station below pitch 3 (20m + 40m) for a really long and awesome first pitch, then do pitch 3 like normal. I do not recommend hiking to this climb at all. The first 75% of the hike is absolutely beautiful and worthwhile in itself. Very cool. But then you get to a talus field. Not too bad, but be a little cautious. Then, you get to a steep scree slope that slides directly into a deadly river. It is absolutely terrifying and I had to turn back after trying to go above the "trail" to find a safer path to traverse, only to find myself in the middle of a very dangerous chute, off balance because I'm carrying all my gear. I feel lucky to be alive and wish I could go back and put up a sign or something. At the end of the rappel, stay on the rock and use the fixed traverse ropes; don't step down onto the scree slope unless you want to rain down stony death on people at the start of the climb by the river. Best to hike in from the parking lot along the clear trail. When waiting for the route be sure to stay clear of the gully... rockfall is abundant from climbers on rappel. Visited on July 31, 2018. Just to preface, absolutely wear a helmet at all times on or near the wall. When others are beginning on the wall or waiting, which will be any time after 7am on any given day, do not hike in, do not walk passed the first rappel station to the higher ledge, and absolutely do not ignore the static lines. You will send sizable rocks down to the groups beside the rather severe rapids on already unstable ground. As well, because of the sound of the river, most warnings get drowned out. Please, rappel in on the stations and use the static lines to get to the bottom of the field. Please do NOT hike into this route. We rapped down behind another party. As we were both on the ground, another pair of climbers hiking in on the SCARY talus field repeatedly dislodged large rocks. The four of us had to smoosh up on the rock face, praying to whatever rock slide gods that a giant rock doesn’t knock us into the raging river. You know that scene in the lion king when simba is enveloped in a dust cloud, crouching, terrified, trying to avoid the stampeding wildebeast? That was what it felt like. The two other climbers did get hit by rocks, luckily nothing large enough to cause more than scrapes and bleeding. It’s dangerous for both the people at the base of the climb and the hikers. Rap down the line that’s on climbers left on the top. The chains are a little over the edge. You can rap down the chains behind the tree, but it’s possible you’ll rap down into parties climbing up. Yes, rapping down you may knock some loose gravel and small rocks down, but just be mindful of your footing and all will be okay. Second pitch (and 3rd if you do it in 4) is a bit run out. Not hard climbing, but a good bit of space between bolts. The last pitch is fun. 3. New hike option - descends directly from the parking at Cheakamus Canyon Picnic Site (don't go along the shoulder at all). This variation ends up traversing in to the base of the route along the river, so there is no chance of dropping rocks. Park at Cheakamus Canyon Picnic Site (49.927288,-123.163679). The trail leaves directly from the parking - it starts to the right of the big sign. From there it gently descends and winds south through some forest and boulder fields. When it gets close to the river, it seems to peter out at a talus field, but if you stay high there's always a trail (there are a few cairns). At this point you can see the Star Chek buttress, but to get to it you have to cross a loose scree field. I can see how this traverse would be somewhat scary for people who are not familiar with scree (for those of us who are used to Cascade choss, it feels pretty chill). However, it is very doable, and probably overall safer for everyone involved.